Benchmarks help identify the key strengths and personality traits needed to be a top performer in a specific role. 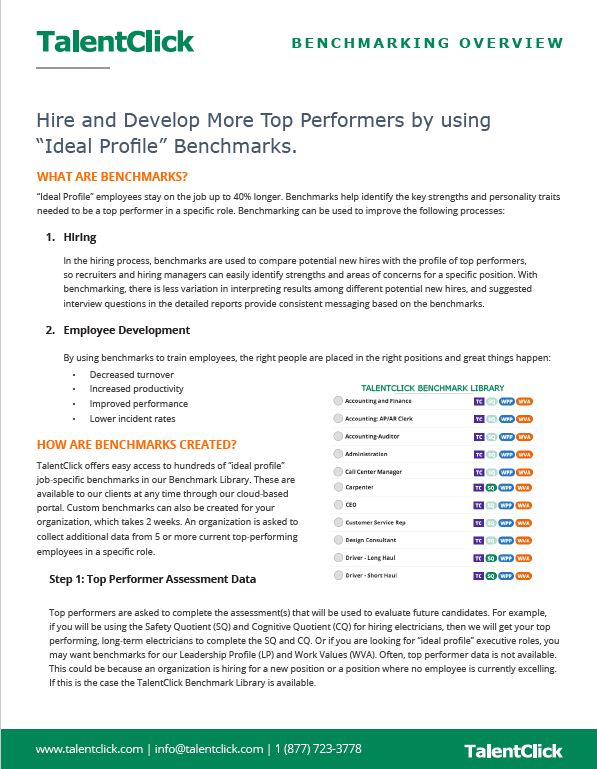 Once benchmarks have been developed, your organization can use them to compare with profiles of new candidates for a role, and hire to match (or complement) a top performing profile. Or, for current employees, benchmarks bring insights for employee development, coaching and self-awareness. Watch this short video on how to use benchmarks effectively. The TalentClick personality assessment(s) that will be used for future candidates in the role. A Job Analysis Questionnaire, which measures the IMPORTANCE and FREQUENCY of key tasks in the role. The data from both assessments is mapped to create an accurate and reliable benchmark report. Benchmarks provide an easy and efficient way to identify strengths and areas of concern. If a candidate’s marker lands within the benchmark range this indicates a good fit for that position because they are similar to the top performers. If a candidate’s marker lands outside the benchmark range, this indicates an area of concern because they are different from the top performers in that specific role. Landing outside a benchmark does not mean an individual can’t do the job. Rather, it means there are certain components of the job that he or she is not a natural fit for. In this case, suggested interview questions are provided to allow you to further assess fit for the role. Benchmarks can also be used for developing existing employees. If an employee’s marker lands outside the benchmark range, this suggests an area for improvement for that employee. Providing the insight into why an employee may not enjoy or excel at certain aspects of a position can be very insightful to them. The detailed Participant reports we offer can be given to the employee for self-awareness, to provide suggestions on areas for employee self-development, growth and self-coaching. Want to learn more about Benchmarking? Download our “Benchmarking Overview” resource today. – Jacob Traynor, Project Manager, Performance Contractors Inc.